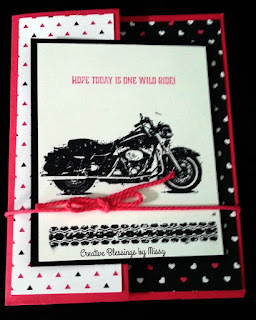 One of my top ten stamp sets from this years catalog is One Wild Ride. I have a lot of friends that ride and I knew it was a must have. I created this card for a female friends birthday. It's a gate fold card. Love creating fun fold cards- they always get ohs and ahs- it's a WOW card!